First National Soil Survey, U.S. Bureau of Soils, 1909. The link below shows an animated reconstruction of the breakup of the supercontinent Pangea, starting ~200 million years ago. 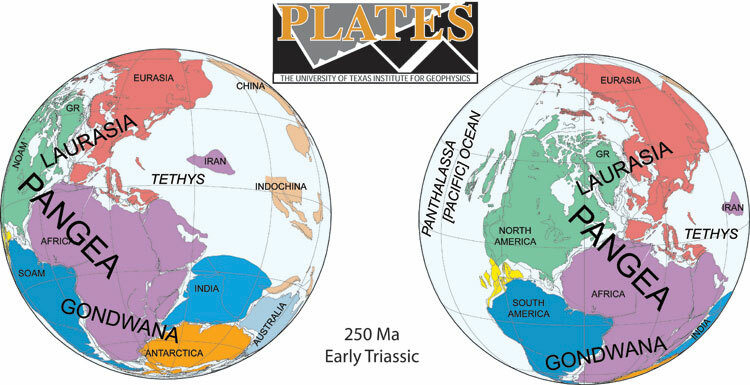 The fragmentation of this supercontinent resulted in the current configuration of continents and ocean basins we see today. These continental motions (on the order of centimeters per year) can be precisely reconstructed back through time because we know the age pattern of the young crust forming the ocean basins, information that was not available 50 years ago prior to plate tectonic theory. The production and destruction of ocean basins through time provides the explanation that was previously missing to explain continental drift. All our elements, with the exception of hydrogen and helium, came from the dying throes of large stars. Amino acids needed to build animal proteins come from autotrophic plant life. Biological studies have shown how certain nutrients (e.g., nitrogen, phosphorus, calcium, magnesium, potassium, iron, etc.) are essential for the process of protein formation. All our amino acids and nutrients eventually come to us from plant life (sometimes via the meat of plant-eating animals). Plants synthesize amino acids from the combination of sunlight, water and soils. Soil is therefore of critical importance to life. Simply put: no soil, no life. We first define soil as a dynamic natural body capable of supporting a vegetative cover. Where there is no soil, there is no plant life and we have barren rock and/or sand. Soil is composed primarily of weathered materials, along with water, oxygen and organic materials. Luckily for us, soil covers most of the land surface with a fragile, thin mantle. Soil and agricultural scientists have identified a huge number of different soil types. Soil is layered into sections called "horizons". Figure 1 shows a typical soil profile developed on granite bedrock in a temperate region. The top horizon is composed of humus and contains most of the organic matter. This layer is often the darkest. The "A" horizon consists of tiny particles of decayed leaves, twigs and animal remains. The minerals in the A-horizon are mostly clays and other insoluble minerals. Minerals that dissolve in water are found at greater depths. The "B" horizon has relatively little organic material, but contains the soluble materials that are leached downwards from above. The "C" horizon is slightly broken-up bedrock, typically found 1-10 meters below the surface. While this is a typical soil profile, many other types exist, depending on climate, local rock conditions and the community of organisms living nearby. The U.S. Department of Agriculture has classified 10 orders and 47 suborders of soils. If you include other subsets, there are over 60,000 types of soil. The lunar surface, which has been produced by meteoroid impacts, is not classified as a soil, but is rather given the name "regolith" (derived from the Greek words meaning cover and stone). The layered nature of soil indicates its long evolution under the effects of atmospheric and biological processes. The process that creates soil from bare rock is called "weathering". In the weathering process, the atmosphere and water interact with bare rock to slowly break it down into smaller and smaller particles. Rock climbers who encounter talus slopes (regions of pebble-life rocks that form in great conical piles at the feet of mountains) experience an intermediate step in the inexorable transition from solid granite to sand and soil. We next discuss the process whereby bare volcanic rock can be slowly turned into soils that can support life. Since early geologic time, the atmosphere has interacted with the Earth's exposed crust though a process known as weathering. Weathering takes place through a combination of both mechanical and chemical means. We have all experienced the results of weathering first hand. Any visit to an old cemetery find us peering at the blurred inscriptions on old marble tombstones. These inscriptions were once perfectly legible, but with the passage of time, the small fractures and cracks in the rock have made it vulnerable to attack by aqueous solutions. A dramatic example of weathering can be seen in these two images of the same 3000 year old Egyptian obelisk just before relocation to damp New York and 100 years after accelerated weathering in New York (Figures 2 and 3, respectively) Weathering rates are obviously a strong function of climate! Many of the original volcanic gases (e.g., carbon dioxide, sulphur-bearing gases, etc.) were able to dissolve in water and produce acids. The acids, in turn, reacted with surface minerals. Later, oxygen in the atmosphere reacted with the exposed reduced materials, making the red beds discussed in an earlier lecture. Since the advent of land plants, soil and surface minerals have been exposed to relatively high concentrations of carbon dioxide maintained in soil pores as a result of decomposition and the metabolic activities of roots. The reaction of carbon dioxide with water in the soil produces carbonic acid (H2CO3) which determines the rate of rock weathering in most ecosystems. Acid rain, produced by human effluents of nitrogen and sulphur-bearing gases will increase the rate of rock weathering in downwind areas. To understand why weathering occurs and why the rate of rock weathering is so dependent on climate, we need to discuss the chemistry of the process in a little more detail. "Igneous Rocks + Acid Volatiles = Sedimentary Rocks + Salty Oceans"
In this chemical formula feldspar reacts with water to produce a kaolinite (clay). Notice that the chemical equation does not exactly balance, that is, not all the elements on the left hand side appear on the right hand side. This is because soluble elements, such as potassium (K) are leached out during the chemical reaction and carried away as dissolved salts. The process of leaching can perhaps best be understood by analogy with the making of coffee. When hot water is passed over crushed coffee beans, the soluble components (making the coffee) are leached away, leaving the insoluble crushed coffee bean remnants behind. In this way, rocks containing feldspars are weakened though the conversion of rigid feldspar to more plastic clays which do not have anything like the same structural rigidity. The process occurs at exposed surfaces of the minerals making up the rock. Through geologic time, large amounts of sedimentary rocks have been deposited as part of this process. In fact about 75% of all exposed rocks on the Earth's surface today are of sedimentary origin and have been brought to the surface by geologic uplift. Of course, geological processes return some of the sedimentary rocks to the mantle of the Earth, where they are converted back to the primary materials under conditions of great temperature and pressure. Rock weathering is also critical for the release of biochemical elements that have no gaseous form - examples are calcium, Ca, Potassium, K, Iron, Fe, and Phosphorus, P. The latter element plays a key role in cell metabolism. Thus, we can say that weathering provides key nutrients for life through the process of leaching. The soluble nutrients are transferred to soils layers below the immediate surface (e.g., the "B" layer). This is a major reason that plants have evolved root systems - to search out these critically needed nutrients below ground. Igneous rock weathering proceeds in stages. It is useful to picture the inside of a rock - made up of interlocking minerals of irregular shapes, each being rigid. Figure 4 shows a microscopic view of such an interior rock composition, with some of the grains being feldspars. As weathering proceeds, the boundaries of the vulnerable feldspar (and other) mineral grains start to decay. As the decay proceeds, water can reach more and more feldspar surfaces and the process accelerates. This process can also be accelerated by melt-freeze cycles that force the grains apart due to the difference between the volume occupied by water and ice. We can see that weathering is due to the combined effects of chemical and mechanical decay. The chemical and physical processes of weathering transform the igneous rock into sand and clay particles and dissolved salts. Chemical weathering can add carbon dioxide, water, and oxygen. The link provided courtesy of the National Park Service shows an example of a weathering rock. It is interesting to note that, since most of the Earth's exposed rock is of sedimentary origin and since sedimentary rocks are a by-product of weathering, most of the rocks that are weathering away in today's world are second or perhaps even third generation rocks. That is, they originated as igneous material, became sedimentary through weathering and transport to the bottom of shallow waters, were then subject to geologic uplift to become again exposed and, finally, began to undergo weathering yet again. The natural world is full of such endless cycles. How fast does a rock decay? The best answer to this question is... it depends. It depends on the local environment and the type of rock. For example, an iron nail buried in the ground in Michigan will only take a year or so to decay to the point that it is easily snapped in two. Iron nails rust much more slowly in drier environments. Aluminum cans decay very slowly, even in humid climates. Glass decays even more slowly, while plastic is considered essentially non-biodegradable. It is somewhat ironic that a plastic tombstone will endure much longer than one made in marble! From what we have already discussed, soils themselves aid in rock decay, as do melt-freeze cycles and bacterial action. Thus, soils are a consequence of weathering, but also a factor in accelerating weathering. The production of soil is a positive feedback process. The following table illustrates rates of weathering for three rock types as a function of climate. As more of a rock becomes amenable to weathering, the speed of weathering increases. This can be understood if we plot the rate at which the available exposed surface area of a rock increases as the rock fragments. Figure 6 shows this relationship. Although living tissue is composed of carbon, hydrogen, and oxygen in the approximate proportion of CH2O, as many as 23 other elements are necessary for biochemical reactions and for the growth of structural biomass. As mentioned earlier, one of the main purposes of plant root systems is to get access to nutrients stored in the soil. Some plants go to enormous lengths to do this. For example, Emiliani (1992) quotes that "A single plant of winter rye, 50 cm high, was found to have a root system consisting of 143 main roots, 35,600 secondary roots, 2.3 million tertiary roots, and 11.5 million quaternary roots! The root system was found to have a total length of 600 km and a total surface of about 250 square meters". Delivery of nutrients into plant root systems can occur by several pathways. In some cases, direct uptake in water solution occurs. Sometimes, plants actually have to protect themselves against too much nutrient intake. Too much of a good thing can prove poisonous. An example of this can be seen in the accumulations of calcium carbonate deposits that surround the roots of some desert shrubs. In general, the availability of nutrients (deficit or surplus availability) often controls the form of the ecosystem, determining its overall productivity, and influencing which particular set of plants come to predominate. Excess nitrogen can lead to the loss of fine root biomass and deficiencies in other nutrients. The pool of nutrients held in the soil and vegetation is many times larger than the annual receipt of nutrients from the atmosphere and rock weathering. Thus, life husbands its needed nutrients on land, storing much of the total in the humus. Recycling of nutrients is critical to the productivity of natural ecosystems, although less critical to crop production, due to the availability of commercial fertilizers. The data of the table came from a study of the famous Hubbard Brook ecosystem in New Hampshire. It shows how effective the soils are in storing the needed nutrients and how limited are the rates of supply from atmosphere and rock weathering. Acid rain caused by human emissions of nitrogen and sulphur oxides leads to enhanced weathering and changes in nutrient ratios. For example, recent studies suggest that forest growth has declined in areas downwind of air pollution. Acid rain appears to increase the movement of aluminum ions, which may, in turn, reduce the intake rates of calcium and other nutrients. In the oceans, life is also limited by the availability of nutrients. 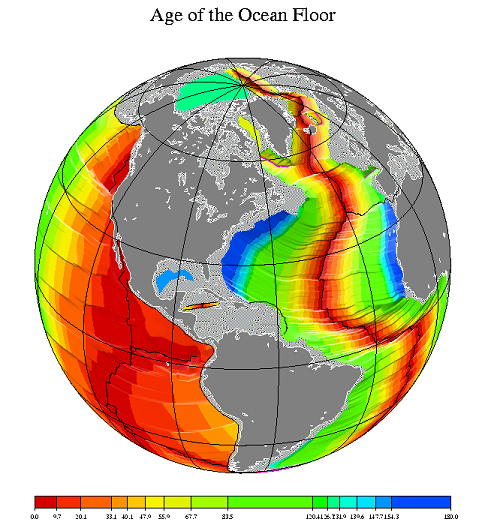 The productivity is highest on continental shelves and in regions of upwelling. Nutrients are removed from surface waters by downward sinking and are regenerated in deep waters. A paucity of nutrients limits production in the open oceans. On the other hand, marine productivity is threatened by excessive human inputs of nitrogen and phosphorus in coastal regions, where it leads to excessive algal blooms, whose subsequent decay robs deeper water of oxygen, creating "dead zones". We define soil erosion as the movement of surface litter and topsoil. The forces responsible are wind and water flow. It is important to recognize at the outset that soil erosion is a natural process. It is slowed, however, by plant roots that serve to stabilize the soil (and thereby husband nutrients, see above). In any undisturbed ecosystem, the rate of soil loss is matched by its rate of production. In a disturbed ecosystem, however, major changes in the rate of erosion can occur. In fact, almost every activity that can be characterized as a "development" causes enhanced soil erosion. This includes farming, logging, building, grazing, off-road travel, etc. Soil erosion, discussed later in this lecture, is responsible for the loss of a great deal of our topsoil. You can see a dramatic example of sediment output from the Amazon river as seen from space. The problem of accelerated soil erosion is a major one. On a global scale, topsoil is eroding faster than it can be replenished in over one third of the world's croplands. For example, in China and India combined, more than 12 million square kilometers have been severely eroded since 1945. The causes of this have been deforestation (30%), overgrazing (35%), and farming (28%). The soil erosion problem is particularly severe if one considers that each year we must feed an extra 90 million more people, with about 25 billion tons less topsoil! (Image from the National Archives). In the U.S., the situation is also of concern. The Dust Bowl of the 1930's was caused by plowing of the prairies. Before the pioneers, the soil was held in place by the long root systems of prairie grasses. In response to the dust bowl, the Soil Conservation Service (SCS) was established in 1935. The Dust Bowl was brought on by a long drought and lasted about a decade. Much was learned about soil conservation and later droughts have not caused as much damage. The Great Plains has lost about one-third of its original topsoil in the past 150 years. Iowa has been particularly hard hit, already having lost half of its topsoil since the arrival of the first European settlers. In California, the current topsoil is being eroded at a rate that exceeds its replenishment rate by a factor of more than 70. The amount of topsoil lost in a day is staggering: Emiliani estimates that the lost topsoil would fill a line of dump trucks 3,500 miles long! The cost of this loss of natural resource is incalculable. Without soil, there is no food. Soils take 10's of thousands of years to form in rock weathering processes. Weathering occurs due to a combination of chemical and mechanical processes that are subject to strong positive (reinforcing) feedback mechanisms. Over geologic time, rock weathering processes have led to sedimentary rocks and salty oceans! Plants obtain inorganic minerals (nutrients) from the soil and incorporate their elements into biochemical materials. Animals may eat plants and each other, and synthesize new proteins, but the building blocks are the amino acids originally synthesized in plants. Soil effectively husbands the needed nutrients in the upper horizons. The availability (or lack of availability) of important nutrients places critical constrains on the type of life that can survive in particular ecosystems. Soil erosion is a very serious problem globally because of its inextricable link to development activities. 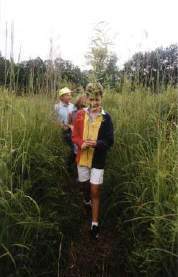 Soil conservation is therefore a very serious business and an important part of future global change studies.